The Seminar was held on 8 & 9 April 2008 at New Delhi. Lt Gen ML Naidu, PVSM, AVSM, YSM, Vice Chief of the Army Staff inaugurated the Seminar. 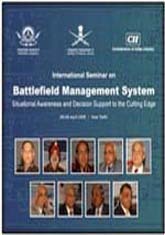 Key speakers at the Seminar included Mr Gautam Sen, Integrated Financial Adivsor (Army) Ministry of Defence, Lt Gen SPS Dhillon, AVSM, VSM, Deputy Chief of Army Staff (IS&T), Lt Gen Avadesh Prakash, AVSM, VSM, Director General of Information Systems, Indian Army. The sessions were chaired by Lt Gen AKS Chandele, AVSM, Director General – EME, Integrated Headquarters of MoD (Army), Major General AK Singh, SM, VSM, Additional Director General Perspective Planning, Major General SK Dhawan, VSM, Additional Director General, Information Warfare, Integrated Headquarters of MoD (Army) and Maj Gen OP Beniwal, VSM, ADG Signal Staff, Integrated Headquarters of MoD (Army). Over 350 delegates attended the two-day Seminar from the Indian Army and the Industry. The participants deliberated on battlefield management systems- user experiences and perspective, Alternatives to CNR in a data intensive environment, COTS hardware customisation & systems integration, current trends in application development, operating system and interoperability, maintaining equilibrium between security, usability and economy, customisation and interoperability in a multi GIS environment etc.